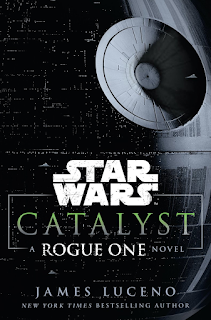 The latest Star Wars Expanded Universe novel, Catalyst, is a direct prequel to the upcoming Rogue One out later this week. It wasn't great. I mean, it was ok. It wasn't horrible or anything. But, it also wasn't a good book on it's own. Mostly, Catalyst is just an introduction to two of the characters that will be in Rogue One. It follows Krennic (that guy in white from the trailers) and Galen (Jyn's father). They both have an engineering background. Krennic is a military man and in charge of overseeing the Death Star building. Galen is a super intelligent scientist doing energy research with kyber crystals. Galen is a pacifist who wants to use his research to provide power to everyone. Krennic slowly ropes him into helping with the Death Star main weapon without Galen ever figuring it out. And that's most of the book right there. Not a lot else happens. There are parts with other characters but they don't really matter that much. It's basically just setting the scene for Rogue One. In a way I'm really glad it doesn't give away any part of the movie. But on the other hand, it contributes so little to the universe that I don't think this book needs to exist. If you aren't a completionist Star Wars fan like me then you should just skip this book.